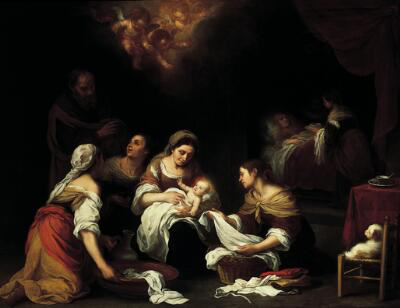 The Birth of St. John the Baptist, Bartholomé-Esteban Murillo, 1655. 56 And Mary remained with her about three months and then returned to her home. 57 Now the time came for Elizabeth to give birth, and she bore a son. 58 Her neighbors and relatives heard that the Lord had shown his great mercy to her, and they rejoiced with her. Calvin’s comments on John’s birth narrative are unremarkable. For Calvin, the main point is that John’s birth is accompanied by several signs that foreshadow his importance. Calvin uses the public nature of John’s circumcision to remind his readers of the Reformed emphasis on the public nature of sacraments. For Calvin, the real meat of this passage is found in Zechariah’s song. Zechariah speaks of God’s salvation coming from the House of David, already directing the reader beyond John to Jesus. For Calvin, this refocuses us on the centrality of God’s covenant with Israel and reminds us that salvation comes from Christ alone, who is the basis of the covenant. This also means that how we read scripture ought to be governed by the thematic centrality of covenant and Christ. Obsessive study of each word of scripture profits nothing if it is not read in this context. The nature of the salvation brought in Christ is manifold. For Calvin, there are a few key points. First, that this salvation comes as deliverance from our enemies reminds us that God’s kingdom is not of this world and that the church is always a pilgrim church, living in the midst of its enemies and trusting God to deliver it. Second, that the salvation that Christ accomplishes is for the faithful of all generations, reaching backwards and forwards historically. Third, that salvation is adoption into the family of God, making us children of God. As such, we are called to obedience to God our Father. The grace we receive in salvation must be applied “to its practical end” (v. 73), meaning that Christians aim for holiness in their lives. Expanding upon this last point, Calvin writes “we give God rightful service when at last our life is ordered by holiness and righteousness” (v. 75). Holiness, Calvin contents, pertains to the first table of the law—those things we owe to God—while righteousness pertains to the second table—those things we owe to our neighbor. In the final part of Zechariah’s song, Calvin latches on to John’s vocation “to give knowledge of salvation” (v. 77) and uses it to further clarify the theme of righteousness. That we need knowledge of salvation means that we are sinners and are incapable of knowing the things we need to be saved. The remission of sin and the righteous life are the reversal of this estate. And yet this righteousness is not of the sort that occurs through human endeavor or work. Instead, it is an imputed righteousness, accomplished by God alone on our behalf.